In late March, reporters for the Vineyard Gazette set out along the shorelines of the Island to see what the latest gale had left behind. And what it had taken away. It had been a hard winter with one blustery northeaster after another. But this last tempest, a two-day storm that intruded rudely on the earliest days of spring, had been “the final straw,” the newspaper said. It was destructive to the coastline and demoralizing to inhabitants. The writers walked along the south shore, the inlets of Chappaquiddick, around the ponds and up and down Vineyard Sound beaches. They returned to their desks awed by what the ocean had beaten up and carried off. Where cliffs rose above the sea, storm waves had reached over the shore and clawed away the foundations of the bluffs. The faces of the embankments were showing signs of fracture, and it was clear how the heights of the banks would soon slump down to the bases. “In other places, the landslides caused by such undermining had already occurred, and boulders the size of small automobiles had been loosened to roll down to the beach below, along with quantities of earth,” one reporter wrote. The storm had opened Edgartown Great Pond to the sea in six or seven places. It had spread broad fans of sand into neighboring ponds, shrinking them noticeably. It had flattened dunes that once protected the whole length of Chilmark Pond from the ocean. It had left beaches cobbled with stone and had cut off walkways around headlands and points. Summer residents would soon return and notice that their houses now lay feet, if not yards, closer to the edges of promontories than they had the Labor Day before. This was the front-page news on March 28, 1958. Alarming, but perhaps not surprising. Fifteen months earlier, on Dec. 14, 1956, the Gazette had published an editorial titled “For Erosion Control.” It called for a complete survey of the Island coastline to determine how much of it had been lost in recent years and how what remained might be saved. Erosion's constant action has been underway since Island's glacial formation. But the story of losses to the Atlantic did not begin there. Forty years earlier, in the summer of 1891, Henry L. Whiting, chief of the U.S. Coast and Geodetic Survey and a resident of West Tisbury, published a report on erosion around the Vineyard. And so on backward to about 6,000 years ago. That was when the dirty, sloping face of the last glacier had long retreated beyond the northern horizon. Torrents of meltwater had filled the distant ocean, which had risen hundreds of feet, and a hundred miles, to flood the old, dry coastal plain on which the Vineyard lies today. The ocean was choosing which nearby islands to drown (among them today the underwater sand dunes of Georges Bank and Nantucket Shoals), which to merely surround (Martha’s Vineyard and Nantucket, among our many neighbors) and which to leave wavering uncertainly between the status of island and shoal (Skiff’s, off the southeast corner of Chappaquiddick). As Islanders reflect this summer on the legacies of their own latest, toughest winter of slumping bluffs, flattened dunes, narrowing beaches, shoaling ponds, fallen boulders, and imperiled homes, it is tempting to think of erosion as a ramification of storms alone. “That the shorelines of the Vineyard are eroding is nothing new or strange. The glaciers made this Island of the most easily removable stuff. This pile of photogenic gravel dumped in the sea is here on a temporary loan. As the Arctic ice pack continues to melt, the level of the excavating tide rises accordingly. In broad geological terms, scientists and coastal engineers say, the Island was rubble on the coastal plain yesterday, is Martha’s Vineyard today, will be Skiff’s Island tomorrow — and all except its highest and rockiest hills, George’s Bank a few days after that. But people are taking especially keen notice of it all right now because the bluffs and beaches — falling back and folding inland before the ever-rising sea — have begun to encroach on things that were built a few years or decades back, things we imagined would always be safe: Our lighthouses. Our coastal roads. Our wharves and piers. Our public beaches. And our phenomenally expensive seafront homes. With respect to many coastal properties, the Vineyard has now officially entered the era of retreat. And the first lesson we are learning is that as far as the Atlantic Ocean is concerned, there is no such thing as erosion control. Two men on Cape Cod have spent much of their careers studying how the shoreline in this corner of the world responds to the rising sea. Speaking this summer to the Gazette, they demonstrate a talent for putting the everyday work of erosion and the costly predicament of humans into lively juxtaposition. Graham Giese is director of the Land and Sea Interaction Program at the Provincetown Center for Coastal Studies. Ted Keon is coastal resources director for the town of Chatham. Graham Giese, Provincetown Center for Coastal Studies. Mr. Keon said: “I don’t know that it was conscious — ‘I’ll give myself 50 years of erosion’ – or that ‘I bought my lot, the lot is this big, and I’ll put the house here.’” Rather, he suggested it was a general sense among these coastline pioneers that the history of a place begins with their discovery of it. Both men said erosion is not so much a process of the rising Atlantic taking earth and sand away from us. Instead it is a process of conveying that earth and sand to the last stop, the place where it’s always really belonged — the flooded coastal plain on which our geological foundation rests. The past winter was a rough one, with 10 easterly storms striking between the end of October and the end of March. The first was Sandy, on Oct. 29, the storm that famously wreaked devastation on Manhattan and the New Jersey coastline. But in this part of New England, Sandy did not howl as loudly, flood as deeply or erode as dramatically as many of the gales that followed. In February, Clarissa Allen, who owns Allen Farm stood on the shoreline at Lucy Vincent Beach, in Chilmark, a place where in the time of her father Roger, sheep and horses had grazed. In the 1920s and 1930s the high cliffs ennobled almost the whole length of the southwestern coastline and heaved their way down to a distant ocean shore, here steeply, there gently. Those cliffs along Lucy Vincent were long gone as of this winter. Where Ms. Allen stood looking out to the encroaching Atlantic, a low spine of bluffs had still edged hopefully along the beach just a few months before. Yet except for the remnant hump of a headland rising a hundred yards to the east, the rest was now all beach, flat as the Sea of Tranquility. 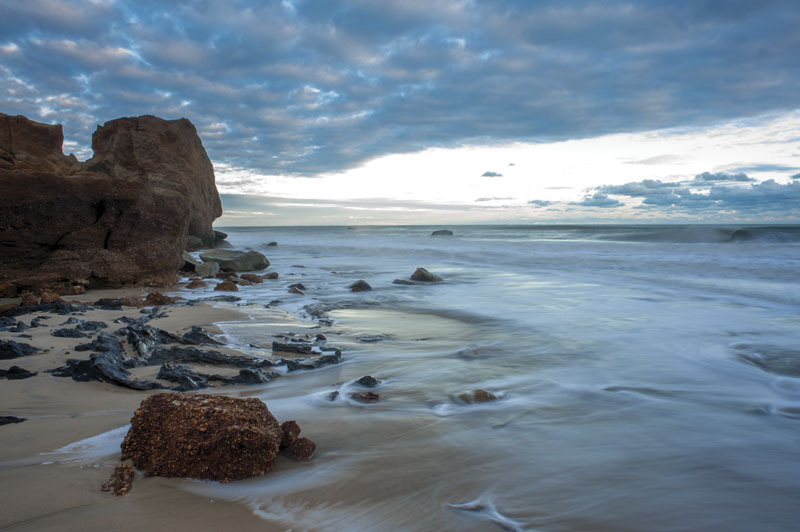 Winter storms wreaked havoc on Lucy Vincent Beach. Winter storms had backhanded them into oblivion. Combers crashed into the remaining lonely bluff, broke off half of its seaward face and dropped it into the froth. Bursting over the top, surf raced down the backside and over the rest of the flattened beach, flooding the western arm of upper Chilmark Pond. Along the way, the surge swept heavy stones to one side, exposed flats of peat and ripped and salted whole stands of viburnum, blueberry and ragweed to brushy skeletons. In early May, Cong. Bill Keating paid a visit to the Vineyard to see what the storms had done to things that Islanders depend on every day. 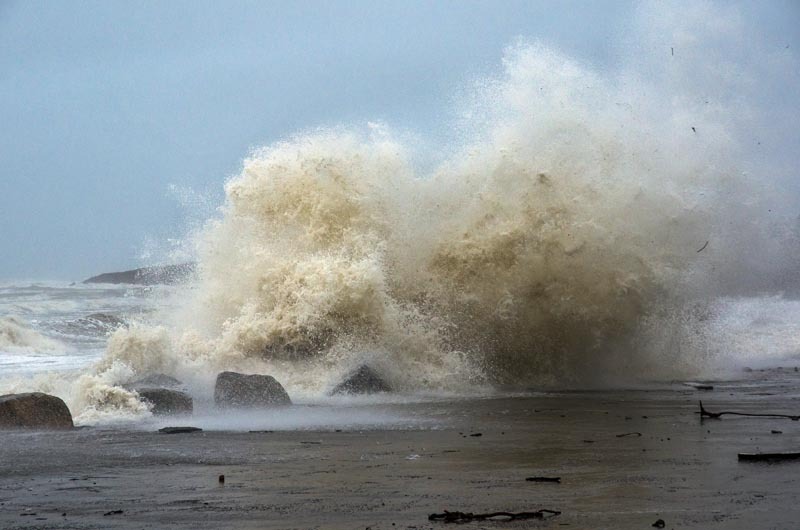 In Vineyard Haven, a seawall that defends a road bordered by the harbor on one side and the lagoon on the other had begun to crack from the blows landed by a parade of northeasterly storms. At East Chop, the seaward lane of a pretty coastal drive was closed because the embankment beneath it was faulting and sliding from the assault of the winter gales. At the northern inlet to Sengekontacket Pond, the harbor master’s boat nearly grounded because of shoaling, a legacy of strong currents and heavy winds all season long. 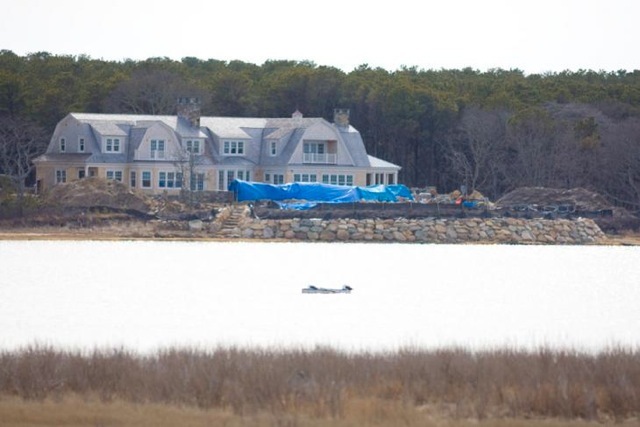 One area affected spectacularly was the southern Chappaquiddick coastline and a large home that was built on the embankment of Wasque Point in 2007. In 2010 an opening through a nearby barrier beach began to deprive the bluffs at Wasque of the sand and beach that had once protected them from direct attack by the Atlantic. 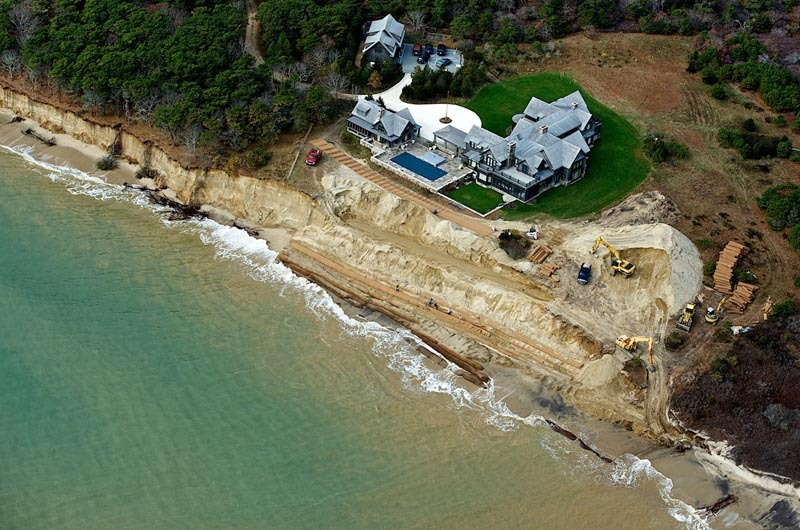 Two years later, the southern flank of Chappy had lost up to 400 feet of ocean-facing beach, a pond that lay behind it and 80 feet of the coastal embankment on which the house owned by Richard and Jennifer Schifter stood. As the winter gales of 2012-2013 thundered in, the bluffs began losing an average of another foot of earth a day. The Schifter house, which had rested 230 feet from the edge of the cliff when built, was suddenly only 25 to 40 feet back after the last northeaster whirled out to sea on March 7. Emergency permits from Edgartown in hand, the owners embarked on a colossal effort to move the house, intact, through a vast manmade trench to temporarily safer ground some 275 feet inland. The frequency and strength of the winter storms, the startling recession of beaches and loss of bluffs all around the Island and the epic Schifter operation provided a backdrop for the finding in the Harris Interactive poll conducted this spring by the Vineyard Gazette: 64 per cent of Vineyard residents, year-round and seasonal, see coastal erosion as their greatest single worry about life on the Island. Clarissa Allen looked at the disappearance of the highlands and cliffs where her father pastured sheep and said: “We lost.” But the fact remains that because of the loss from a bluff, a beach on the Vineyard coastline almost always gains. When ocean surf washes over a beach to pull away the base of an earthen cliff, it converts much of this dug-out rock, clay, dirt and grit to sand, coastal geologists say. In a process known as sediment transport, wind and waves create a current and move much of the sand in a sawtoothed pattern down the coastline. The surf spreads the sand at an angle across the beach, building it up. But Mr. Giese and Mr. Keon note that the retreating waves also pull some of it directly back to feed the offshore shoals and sandbars of the submerged continental shelf. There is a seasonal rhythm to this process, noticeable to those who walk South Beach year-round. In winter, the height and strength of the waves tend to drag more sand offshore than they deliver onshore. The beach narrows and scarps, widening and flattening again only when the waves of summer ease, returning more sand to the shore than they take away. Unarmored barrier beaches protect against rising sea. Gales interrupt and quicken the pattern with northeasters in winter and spring and tropical storms in summer and fall. What people see immediately is what a storm cuts into and takes away. But the process is not quite as simple as that, said Jeff Donnelly and Andrew Ashton, scientists in the geology and geophysics department at the Woods Hole Oceanographic Institution. They specialize in how changes in the climate can also change a coastline. We think of storms as evil eroders, but really storms are also builders,” Mr. Donnelly said. “And they’re essential in terms of keeping [beaches] building vertically and keeping up with sea level rise.” Storm waves wash over dunes and beach to build up the backside of a shoreline — the landward direction in which the beach is retreating anyway because of the inexorable rise of the sea. The most harmonic and efficient defense against a rising sea is an unarmored and unaltered barrier beach folding itself inland day by day, slowly in peaceful periods and more rapidly in stormy ones, the coastal experts say. Jo-Ann Taylor, coastal planner for the Martha’s Vineyard Commission, has long studied this process. “We know from the historic erosion rates, there’s a foot to a foot and a half [of retreat per year] on the Gay Head side, and then as you move down the south shore, you get to Chilmark Pond, and you’ll be at two and a half to three feet a year,” she said. The material at the western end of the southern shoreline is coarse, and farther east it grows finer and more easily movable. Beaches narrow and widen with the seasons, but when bluffs erode and rocks and earth fall into the sea, they’re gone until the next glaciation returns with more rocks and earth to build them up again, scientists concur. Hence the retreat of the coastline as a whole. There is naturally a conflict when the rolling in of a beach or tumbling back of a bluff reaches a home or road or something else in which people have made a sizeable investment. With the warming of the planet, the rate of sea level rise has increased significantly in the last hundred years. The only issue is whether the rate will continue to increase in this century. Thirteen years in, there is debate. But few dispute that the rise itself will continue. Scientists interviewed by the Gazette agree that relatively brief changes in weather patterns and sea conditions might make the rate look and feel either greater or less as the century moves along. When the Atlantic finished surrounding Cape Cod and the Islands 6,000 years ago, it still lay nearly 20 feet lower than it does now, said Mr. Ashton of Woods Hole. At that point, what had been a torrid rise for millennia slowed notably to only about three feet per thousand years, bringing the sea level roughly up to where we are today. Rising sea level is increasing destruction of storms. Then beginning about 125 years ago, the rate suddenly surged again to a bit more than a foot per century. Scientists attribute about half this rate to a process called subsidence, a long-term lowering of the crust in our quadrant of New England following the retreat of the glacier. So some of the rise of the sea can be tracked to prehistoric and uncontrollable geological causes. And the newest jump in the rate started just before man began adding a great deal of carbon dioxide to the atmosphere in the 20th century. With the global rate tripling in the last 130 years from the rate of the previous 6,000 years, it is possible that it will triple again, to a rise of three feet in the next hundred years, according to a recent report of the Intergovernmental Panel on Climate Change (IPCC), sponsored by the United Nations. “Do we see any evidence of acceleration? I’ve brought up that point as a way of questioning whether the high-end estimates could be correct,” said Rocky Geyer, chairman of the applied ocean physics and engineering department at the Woods Hole Oceanographic Institution. There are also short-term variations to consider. Mr. Donnelly takes a different view. “It doesn’t look good,” he said, pointing to satellite data estimating mean sea level around the world. The data confirm that the current rise is “already on the upper part of that trajectory. . . . The whole notion that we were potentially going on these different pathways and [might still have] a more modest rate seems to be completely blown out of the water,” he said. On the Island, the first grand efforts to engineer things along the coastline began at the start of the 1900s. As part of a huge statewide effort costing $70 million, the board of harbor and land commissioners authorized the opening of a freshwater lake at Oak Bluffs and the dredging of a creek at Menemsha to create the harbors known there today. Eventually it became clear, however, that even the stoutest jetties, ramparts and groins defer erosion rather than prevent it. “There are often some gaps where the water does get in, or it goes over the top of the structure, or pours into the back and starts eroding,” said Peter Traykovski of the applied ocean physics and engineering department at the Woods Hole Oceanographic Institution. 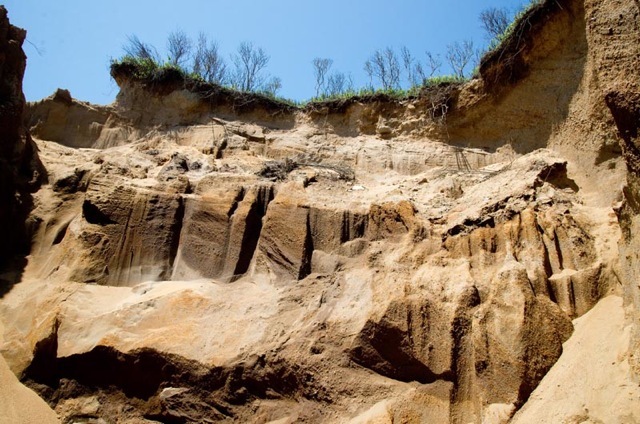 People began to see that when such a structure fails, often during storms, the bluffs behind slump dramatically and beaches jump inland, making up for lost time. Revetments not allowed on homes built post 1978. A different set of challenges, just as complicated, arises when it comes to the defense of seaside houses and private property. With the passage of the state Wetlands Protection Act in 1978, homeowners are prohibited from building so-called hard structures — seawalls known as revetments — if the house was built after August 10 of that year. But building revetments and walking away — indeed, building anything that stifles the erosion of bluffs and movement of sand — proved to be problematic, scientists and engineers agree. Seawalls deprive the beach of sediment from the bluff and groins keep it from moving along the beach, worsening erosion for neighbors down the longshore current. Which causes the neighbors, if their homes qualify, to apply for seawalls or groins of their own. “It’s an additive process,” said Greg Berman, a coastal processes specialist for Woods Hole Sea Grant and Cape Cod Cooperative Extension. “If one person does it, another one might do it, and it’s getting compounded over time. 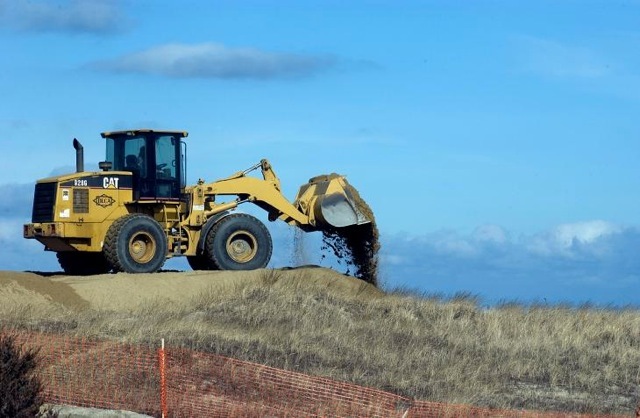 So your overall beach is going to be lowered.” This is why permits issued today for hard structures to protect qualifying houses often come with a requirement that the owner continue to add sand that the revetment would otherwise keep from the beach. “We may let you put the revetment in, but since that revetment has a very obvious impact to the sediment supply, we also want you to place a commensurate amount of sediment into the system that is now being denied by that bank, so that the natural system thinks nothing has changed,” Mr. Keon said. This is where the business of erosion and engineered defenses of the coastline — both publicly and privately held, on the Island and elsewhere — grows tremendously expensive and increasingly political. The offices of the Woods Hole Group stand in the woods of an industrial park one exit up the highway in Falmouth. Leslie Fields and Tara Marden, both coastal geologists at the company, have been dealing with erosion all around the Vineyard for years. Ms. Marden agreed. “You can’t put a bump in the shoreline and think it’s going to last there. One storm and the whole thing is going to spread up and down-drift,” she said. So to engineer a successful nourishing project, they said towns must forget borders and neighbors must ignore property lines, working together to spread the sand and the costs among them. The second point is that the price can be shocking. To truck in sand and spread it along a beach may cost $30 to $40 per cubic yard; even a modest project can call for 100,000 cubic yards. And since no replenishment scheme lasts forever, towns and landowners must plan on redoing the job periodically — forever. Nourishment is a costly, perpetual process. The DMF is chiefly responsible for safeguarding habitat and breeding grounds for shellfish and finfish. There are concerns not only about disturbing the bottom where the sand might come from, but also on the beaches where it might go. The agency generally requires that sand be placed above the high tide line, because shellfish often live between that line and the water. 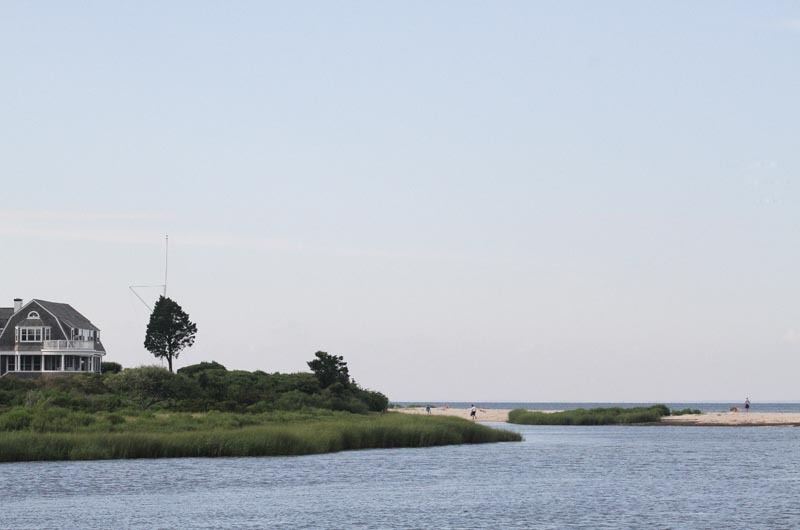 But Mr. Keon, the Chatham coastal resources director, believes that with roads, public beaches, town properties and homes worth hundreds of millions of dollars at risk around the commonwealth, the argument may soon shift. Day and night the states of New York and New Jersey have pumped millions of cubic yards of sand onto their shorelines to rebuild them after Hurricane Sandy. Setting aside the issues of habitat, some ask why it is not possible to halt or at least slow the erosion of the southern coastline of Martha’s Vineyard the same way. Experts interviewed by the Gazette say it will never happen. The Jersey coast, like the beaches in front of Miami or Santa Monica, are entirely engineered, designed and constantly replenished to defend hotels, condominiums and businesses from the rising sea, as well as to attract visitors by the millions to the shoreline. Era of retreat has arrived. “They realize that that is their lifeblood, in many ways the economic engine for the entire state,” said Mr. Keon, who served as chief of coastal planning for the Philadelphia district of the U.S. Army Corps of Engineers and helped devise many of the manmade beaches along the Jersey shore. By contrast, the southern shoreline of the Vineyard is natural, largely undeveloped, mostly unpopulated and wildly exposed to the Atlantic. And in places where the beaches are privately owned, they are disqualified from sharing in the hundreds of millions of dollars in federal aid that it would take to nourish the public beaches to either side of them. Meanwhile, people living on the cliffs, especially along the southern coastline, realize that the era of retreat has arrived. The beaches and bluffs have now backed up to those lines of supposed safety where so many houses were so recently built. This year, some owners are moving their homes back at great expense; others are taking them down by order of the town. An aerial review of the 17-mile shoreline from Squibnocket east to Chappaquiddick shows that scores more owners will have to make the same difficult choices in the next few years. So will others on more protected coastlines on the northern side of the Island. Towns themselves face costly decisions. The Gay Head Lighthouse must be moved within the next two years. Chilmark is just beginning to work out where to pull back a beachfront parking lot at Squibnocket and build a new road over to the seafront houses at Squibnocket Farm. Oak Bluffs confronts a slumping embankment and a threatened coastal road at East Chop. “You live along this dynamic system and you need to understand that,” said Mr. Giese. “And come to the realization that there is no solution to this problem. It is an ongoing issue. And you’re trying to manage it as best you can. It isn’t a one-time thing. Jo-Ann Taylor agrees. She is beginning to plan what she hopes will be a series of meetings with town officials and residents, year-round and seasonal, to coordinate a new human response to a prehistoric natural process.